What is National Drive Electric Week (NDEW)? For information about the local event we are hosting and to sign up to attend or volunteer, go to our official event page here. National Drive Electric Week started in 2011 as National Plug In Day. The idea was to hold simultaneous events across the country on the same day, uniting for one cause. Over the past three years the event has grown and transformed from a day to a weekend to an official week long celebration with a new name making it clear that the idea behind the event is to promote driving and widespread adoption of electric vehicles. Plug In America, Sierra Club, and the Electric Auto Association serve as the national team providing support to the NDEW events throughout the country. The NDEW website hosts the main event location map and local event volunteer & attendee registration pages in addition to numerous resources for City Captains so they are able to hold successful events. 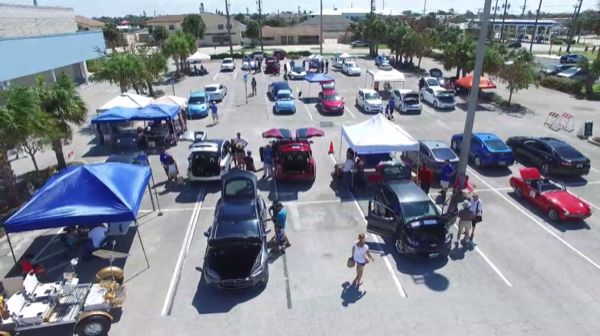 These three organizations partner with the many other groups, organizations and individuals such as the Space Coast EV Drivers to bring National Drive Electric Week to communities such as Satellite Beach, FL. For more information about this annual event head to the Drive Electric Week website.